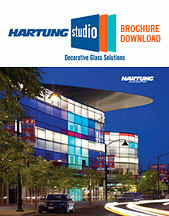 Introducing Hartung Studio; the Decorative brand of Hartung Glass Industries. Hartung Studio represents the limitless combinations of glass, color, texture, imagery and opacity that can be created through blending Hartung's IMPRESSIONS Silk Screened Glass with IMPACT Decorative by Lami Glass. Although only limited by one's imagination, applications include SURESTEP Stair Treads & Flooring, TOTAL Vision System (TVS) Doors & Showers, canopies and spandrel panels. Hartung Glass Industries is a Seattle based glass fabricator with 11 tempering ovens and 12 locations throughout British Columbia, Washington State, Oregon, California, Arizona, Utah, Texas and Indiana. Hartung Glass has been providing innovative glass solutions to architects, glazing contractors and glass shops for over 85 years and has been listed multiple times on USGlass Magazine's Big Book of Lists including Top Insulating Glass Producer, Top Tempered Glass Producer, Top Laminated Glass Producer, Top Fire-Rated Distributor, Top Shower Door Producer and Oldest Companies in the Industry. Through technology and innovation, Hartung Studio has the solution for your inspiration.